QUEEN OF KATWE / Live Q&A on Periscope and via Satellite! TODAY! Tune-in tonight at 6:00pm PST for a live Q&A with the cast and director of Disney’s “Queen of Katwe.” David Oyelowo, Lupita Nyong’o and Madina Nalwanga will be joining director Mira Nair for a discussion of the film moderated by Dave Karger and will respond to questions from fans in 33 theaters around the U.S. and live on Periscope and Twitter @DisneyStudios, bringing the live conversation to fans across the globe. Disney is the first movie studio to work closely with Twitter to experiment with a new way to create high quality, produced live video on Periscope. Phiona Mutesi and Robert Katende, upon whose life the film is based, will also be in attendance as special guests. 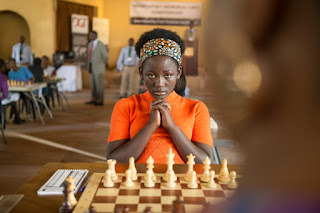 “Queen of Katwe,” which is based on the vibrant true story of a young girl from the streets of Kampala, Uganda whose world rapidly changes when she is introduced to the game of chess, opens in U.S. theaters in limited release on September 23, expanding wide September 30, 2016.